This workshop is aimed at those who would like to gain skills and confidence in telling stories whether to children or adults. It is suitable for parents, teachers or those working with community groups. It covers how to remember stories, how to lift them from the page, and ways of connecting with stories together with some basic voice work. This workshop is aimed at anyone who would like to work with autobiographical tales whether beginning storytellers or those with some experience. We will start by exploring a wondertale with all its wisdom and look at the transformations that occur along the way on the hero’s journey. Then we will look at turning points in our own lives and learn how to craft a true life tale. It is where the personal meets the universal that these tales can act as a gift and inspiration to others. 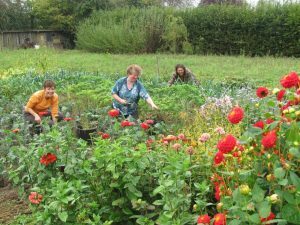 As an organic and biodynamic gardener for many years, I have told a lot of stories outside in gardens and on farms working with groups of both adults and children to foster a deeper connection with nature through story. This workshop is based on that experience and is aimed at those who would like to incorporate storytelling into their work outdoors eg in forest schools or woodland centres. It will help begin to build a repertoire of nature stories, include some nature-based story activities and games and will look at stories appropriate for different seasons of the year. All workshops are designed to be 15 hours in length but can be adapted to suit your group and be offered in different formats eg over a weekend or series of evenings. I can offer a two hour session with your group out in nature with a selection of stories suitable for the season interspersed with story games and activities.